Prep 4 have been very enthusiastic about their new World War 2 topic. We have been incredibly lucky to have so many girls bring in such wonderful WWII memorabilia to share with the class. Thank you to all parents, grandparents and other family members who kindly sent items in. Throughout our WWII topic, Prep 4 have also been learning about food rationing and what different types of food people would have used for cooking and baking. 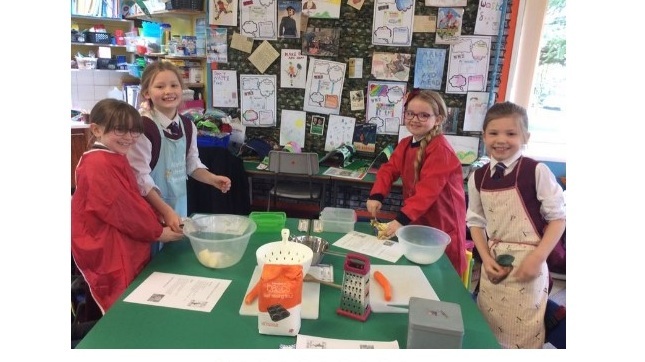 We had lots of fun making our own carrot cookies and they were surprisingly quite tasty, although I don’t think we would swap them for chocolate chips anytime soon! Prep 4 welcomed Dr Ben Harrison, a computer engineer from Alert Logic. He taught us how computers helped us win the war by breaking the enigma code. We made up our own codes and tried to crack them which was great fun. Posted on January 30, 2019 by Miss Thompson. Our class went on a school trip to Cultra to learn about houses in the past. It was great fun! We were split into groups and each group went to a different place. First we made soda bread, it was delicious! The ingredients were buttermilk, flour, baking soda and salt. It was cooked on a griddle above an open fire. After that, we went to explore all the of the old houses and buildings. We saw the police station, the bank manager’s house, the post office and the printer. The houses in the past were dark, cold and very small. We were disgusted by the outside toilet! We would not like to have lived there but if we had to choose one of the houses, we would live in the bank manager’s house as it was much nicer. We had a fabulous time and especially loved visiting the old sweet shop. Prep 4 have been so busy this term already! We have been getting used to all the new routines and expectations in Prep 4 and have all made a fantastic start. It’s going to be an exciting and extremely fun year! Posted on September 26, 2018 by Miss Thompson. We have sadly come to the end of our WWII topic, but we really enjoyed learning about what food they had during the war and we baked some carrot cookies. We were surprised at how nice they tasted! We also created some wonderful slide shows which we presented to the class about our family in WWII. Posted on April 17, 2018 by Miss Thompson. Prep 4 celebrated Chinese New Year and enjoyed creating the most colourful Chinese lanterns. Posted on February 22, 2018 by Miss Thompson. We had a wonderful time experiencing what life was like during WWII in Castle Ward. We go to plant beans, found out about how to cook during the War when many food items were rationed, and we joined in with some VE Day celebrations. The girls had a fantastic day and were a credit to Miss Waugh and the school. Prep 4 are enjoying our topic of Data Handling in Numeracy this term. We created our own Carroll Diagrams and sorted 2D shapes into different categories. We have now started our new topic of World War II and we are really enjoying learning and finding out lots of interesting facts about what it was like to be a child during that time. We have been conducting interviews at home to find out if any of our family members were involved in World War II. Some of us even found some World War II memorabilia which we have enjoyed sharing with the class. Prep 4 had a great time on the Water Bus learning about how water is cleaned so we can drink it safely, and why it is important to not use too much water. Prep 4 had a wonderful time visiting the Ulster Folk and Transport Museum to experience what houses and homes were like 100 years ago compared to what our houses are like now. We had lots of fun going to the old bank, church and weaver’s house. We could not believe how small some of the houses were, and did not like the idea of having a toilet outside! The girls also got to make some soda bread using a griddle on a fire, it was delicious! We all had a fantastic day and the girls were a credit to the school. Posted on November 29, 2017 by Miss Thompson. We had lots of fun celebrating International Day of Languages and even made ourselves some delicious pizza while finding out lots of interesting facts about life in Italy. As I am sure you are all aware Victoria Prep are taking part in the Beat the Street Challenge with other schools in the local area. We are very competitive in Prep 4 so we have been hitting the streets to collect as many points as possible for school. In class, we have learning about Journeys and Travel within our World Around Us topic. Beverley from Sustrans came to talk to us about how to keep ourselves safe when travelling and we had lots of fun when we took part in an active travel themed treasure hunt! Posted on October 11, 2017 by Miss Thompson. We had such a fun Sports Day at Inchmarlo this year and weren’t we so lucky with the weather! Prep 4 had a fantastic day and we all really enjoyed taking part. Thank you to all the mums and dads for joining in too – we had a great time cheering you on! 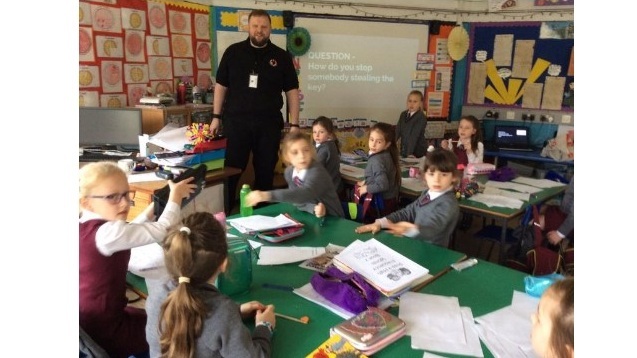 Prep 4 had a visit from Barbara and Gareth from Young Enterprise on ‘Our Community’. They had lots of great discussions about different jobs and shops that they might find in their own town and why these are important. The girls had to solve various problems in the community such as decide what to do with a closed down restaurant. Barbara was very impressed with all the wonderful ideas! Prep 4 have become sugar detectives! Within our ‘Superhero’ topic this term, we have been investigating how much sugar is in our food and drinks. We were so shocked at how much sugar was in some of the things we eat every day! Here we are being detectives! Vivian Marchetti recently joined us in Prep 4 from Mahoning Elementary School in Pennsylvania. Vivian’s former teacher from the school, Mrs Rodgers visited Prep 4 on Friday 28th April to talk to the girls all about school life in America. The girls listened intently and asked some very interesting questions. They also recommended interesting places that Mrs Rodgers could visit in Northern Ireland whilst she is here. Posted on May 3, 2017 by Miss Thompson. Prep 4 dressed up in pink and red for Valentine’s Day and had lots of fun making Valentine’s biscuits. They were delicious and we had to stop ourselves from eating them all in one go! Prep 4 have been learning about Data Handling in numeracy this term. We have looked at making Bar Charts, Pictograms, and Pie Charts. We learnt how to use Carroll Diagrams to sort 2D shapes into different categories. On Thursday 9th February 2017, Prep 4 were evacuated to Castle Ward for the day. Thankfully we were very prepared and had made our gas masks and boxes to keep us safe. We had so much fun throughout the day and learnt all about how people had to ration food, what children would have packed in their suitcases, what games they would have had during WWII, and how to plant broad beans to help “dig for victory”. The girls were exceptionally well behaved and Miss Waugh and Mrs Fallon were incredibly proud of them all. Prep 4 finished off our ‘Houses and Homes’ topic with a trip to the Ulster Folk and Transport Museum to explore all the old houses and buildings. We had so much fun but couldn’t believe how small the houses were years ago and we are all in agreement that we definitely wouldn’t like to use the outside toilets! We enjoyed the baking workshop where we made soda bread using a griddle on the fire. We enjoyed eating the soda bread even more! Some groups explored the old school and police station and poor Mrs Fallon nearly got locked in prison! We all had a fantastic day out! Posted on January 30, 2017 by Miss Thompson. Prep 4 Surveyors in the making! Prep 4 have been super busy this term learning all about ‘Houses and Homes’. We have been building our own houses using lego and junk material, and we have been learning about houses around the world. On Friday 25th November we wrapped up with lots of layers and went on a very cold walk around the local area to complete a house survey. We found lots of different types of houses and had lots of fun sliding on the icy pavements! Everybody could see us very clearly as we were dressed up in bright colours for the ‘Ditch the Dark’ campaign! Posted on November 30, 2016 by Miss Thompson. Posted on September 14, 2016 by Miss Thompson. Prep 4 successfully completed a 1 mile sponsored walk while carrying lots of heavy water! We were very tired by the time we got back to school, but it made us think about all the boys and girls in other countries who have to walk over a mile each day to collect clean water for their family. Thank you to everyone who sponsored us. Posted on May 30, 2016 by Miss Thompson.